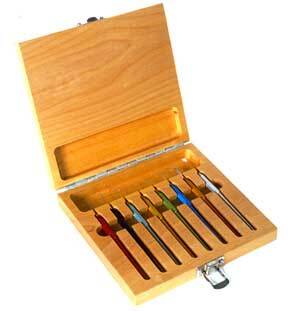 Contains eight tool tips with integrated, color-coded handles which are light-weight, non-rolling and well balanced. Overall tool length is approximately 127mm (5"). Tip size is 0.8mm (.030"). Tip material is oil-hardened tool steel, nickel plated. 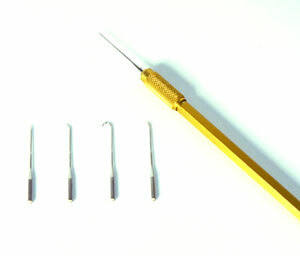 Set contains Straight Micro- Prober, 30 degree Micro-Prober, 90 degree Micro-Prober, Micro-Chisel, Micro-Knife, Micro-Graver, Micro-Diamond Scribe and Micro Measuring Scale. Includes 1 lightweight precision handle and 4 interchangeable tools. 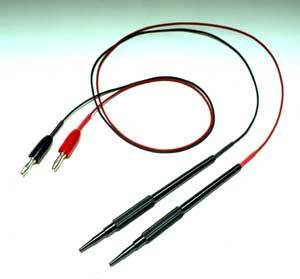 Applications include manipulating, scribing, spring assembly and probing. The handle is finely balanced non-rolling gold anodized with split collet and knurled lock nut. Length is 120 mm (4.7"). Precision forged and ground tools are hardened and nickel plated tool steel with sharp tips. 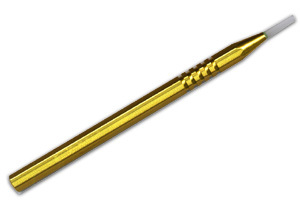 The new Sapphire burnishing tool SBT-120 is indispensable for delicate burnishing of fine instrument parts such as miniature pivot points, shafting, probes etc. Materials can be hard steel, carbide, glass and ceramics. May also be used for deburring of soft and hard materials. The precision ground Sapphire (ground on all 5 exposed surfaces) is mounted in a non-rolling (won't roll off bench) hexagonal gold anodized aluminum holder. It is sold in a plastic storing and shipping container, one tool per container. Sapphire Dimensions: 1.5mm x 2.3mm x 14mm Exposed Sapphire, (.06" x .09" .56"). 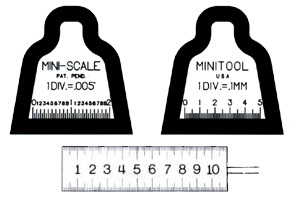 These unique measuring scales may be used directly under a microscope or magnifier for speedy measuring of small parts, grooves, slots, line widths, holes, chamfers etc. Precision fabricated from stainless steel, the scales are spot welded to bendable stainless steel shafts and mounted in gold colored, non-rolling handles. Each scale is individually packaged in a plastic enclosure. Overall length of scales is 83mm (3.25"). 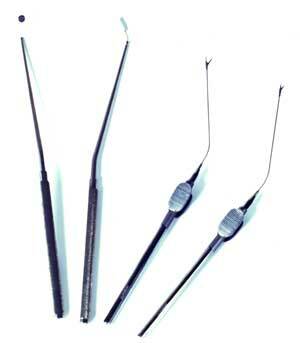 These precision hand held instruments can be used for scoring and cleaving of all types of optical fiber. MT-74 Retractable Diamond cleaver is retained in a quality metal casing with pocket clasp. Ground and polished natural diamond had 90 degree included angle with a relief angle of 30 degrees. MT-76 Retractable Sapphire Cleaver is retained in a quality metal pen type casing with pocket clasp. Ground and polished natural sapphire wedge with a 60 degree included angle. MT-77 Carbide cleaver is made from a solid carbide rod. It has two angled sides which intersect into very sharp cutting edge of about 4 mm in length. A third angle is lapped on the very tip to prevent breakage. Carbide is mounted into a non- rolling hexagon shaped anodized aluminum holder. 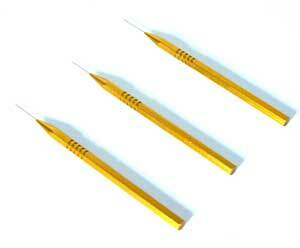 Uses include support and connector ferrules for optical fiber, wire feeding, fluid mechanics, miniature tool holding and fine instrument work. Standard length is 30mm (1.2"). Outside diameter is 1.5 mm. Hole sizes from .10mm to 1.2 mm dia. Available with single or double entrance funnel. Please ask for special information sheet on stainless tubing showing sizes, tolerances and prices. Especially Designed for Precise Manipulation in areas of limited access. Extra Delicate. Combines features of MTW-5 with added strength. Broad, tapered shank, extra sharp tips. 107mm (4.2") in length. Designed for optimal visibility under microscope. Narrow beveled shank, extra sharp tips. 107mm (4.2") in length. Precision instrument for maximum mobility in areas where obstructions prevent access to object. Curved shank, extra sharp tips. 100mm (4.3") in length. 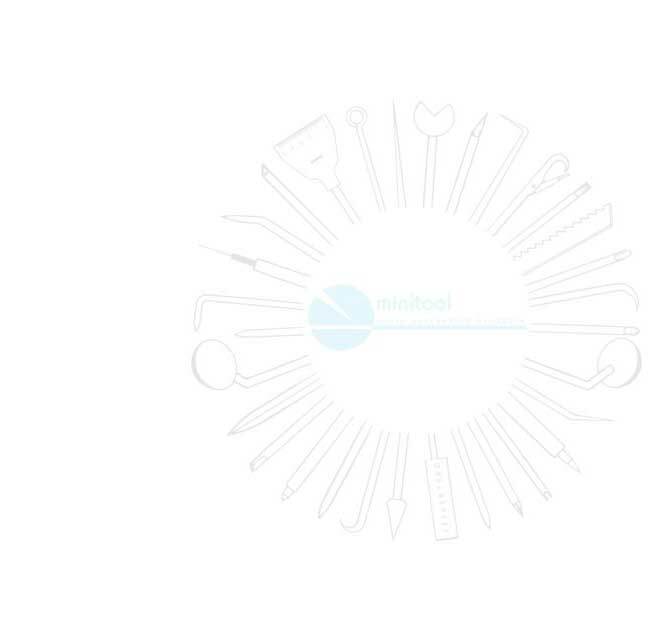 Minitool micro scissors and instruments are manufactured to the most exacting specifications. 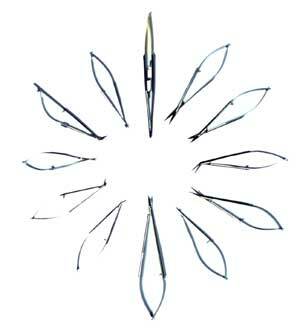 All instruments are hand crafted, from the finest surgical stainless steel, fully guaranteed and priced competitively. All our micro scissors are made by our affiliate in Germany. Extended Reach Micro Ruler, Scissors, Forceps and Mirror. ©Copyright 1999-2011 minitool, Inc., manufacturers of precision instruments and small tools. All rights reserved.